You may receive updates from Barnard No Aramark, the creator of this petition. Barnard College's dining services are provided by Aramark, a company that profits off of the abuse of prisoners. Aramark caters to over 500 prisons nationwide, and has a history of under-feeding prisoners and providing them with unsanitary or inedible food. It has a vested interest in the maintenance of mass incarceration and the prison-industrial complex. 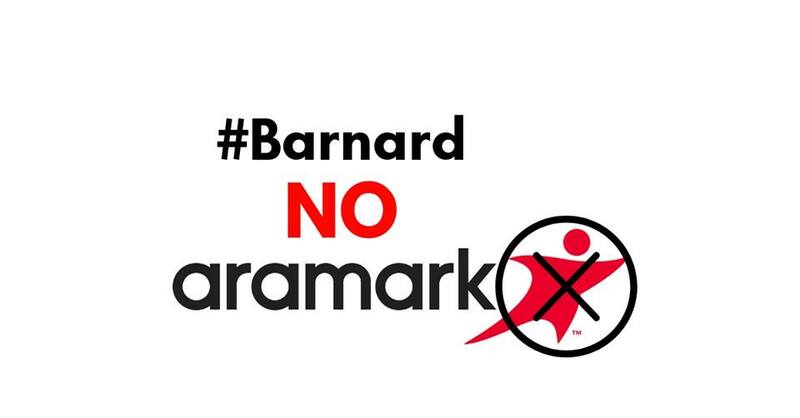 This year, Barnard is renegotiating its contract with Aramark. The time is now to let the administration that we say NO to Aramark. We the students understand the challenges and the amount of work that go into providing dining services to such a large and diverse student population. Therefore, we are dedicated to working with you, the Barnard Administration, in making the most responsible and informed decisions about our dining policy moving forward. The Aramark corporation is the sole dining provider for all Barnard dining options, including Hewitt, Diana, Liz’s Place, and Pete’s Coffee. Aramark is also a billion-dollar corporation that profits off of the abuse of prisoners in over 500 prisons and jails nationwide. It has a long rap sheet of underfeeding prisoners , serving prisoners unsanitary and sickening food , and a history of employee misconduct including cases of sexual harassment , and labor exploitation in the prisons it claims to serve. Beyond these basic human rights violations, Aramark has a vested financial interest in the continuation of mass incarceration and the prison industrial complex which disproportionately disadvantages people of color across America. Barnard prides itself as being a progressive women’s college at the forefront of the fight for equality. The re-negotiation process this year is an opportunity for Barnard to lead the academic community in socially sustainable practices and refusing to partner with corporations that perpetuate racial and socio-economic inequality. Barnard’s mission is to prepare students to “lead and serve their society.” This is a chance for Barnard to honor that mission by making a bold statement: We will not affiliate with companies that profit from mass incarceration, and benefit from the plight of people behind bars. We urge the administration to deny Aramark the opportunity to bid, and firmly refuse any future engagements with Aramark on campus. This will also open an opportunity to advocate for food that is fresh, locally and ethically sourced, and affordable. We demand that Barnard reinvent its approach to dining on campus, beginning with the boycott of Aramark. The students of Barnard College.